oh my this is just way too cute!! I love it!! cute. love the two papers in the background! Looking forward to the 6x6 series! This is BEAUTIFUL! 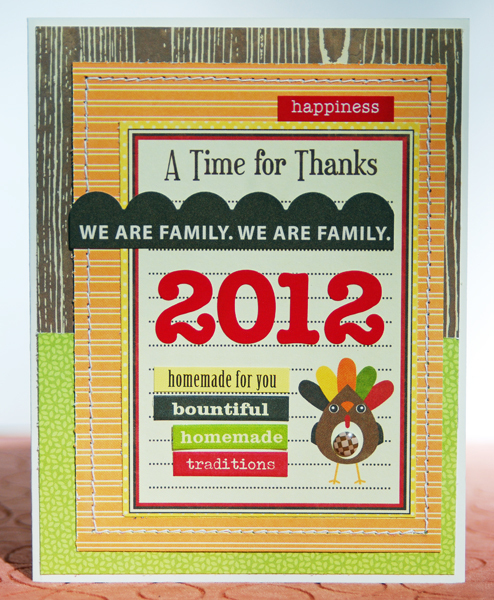 I loveeeeeeeeee the colors, the turkey and love love love love love the stitching!!!! What a great card, Lisa! SO cute and love that metal in the tummy - LOL!! Such a cute card! Love that turkey! Adorable and fun. Love the papers. What a great idea to send a card to the person hosting. I really should do that this year. Beautiful card! Love the design and all the layers and how the scalloped border goes outside the center piece! So adorable! I love that little turkey! That card just makes me smile :) Cute! Your turkey day card are so vibrant and fun! so cute! Love the turkey. I like that, so nice! That's an awesome fun card! Soooooo cute! Love this design right down to the turkey's belly!